To characterize physics teacher education programs in order to provide guidance for self-improvement and enable comparisons among programs. Downloadable PDF and interactive Excel versions of the PTEPA Rubric are available at: https://www.phystec.org/thriving/. 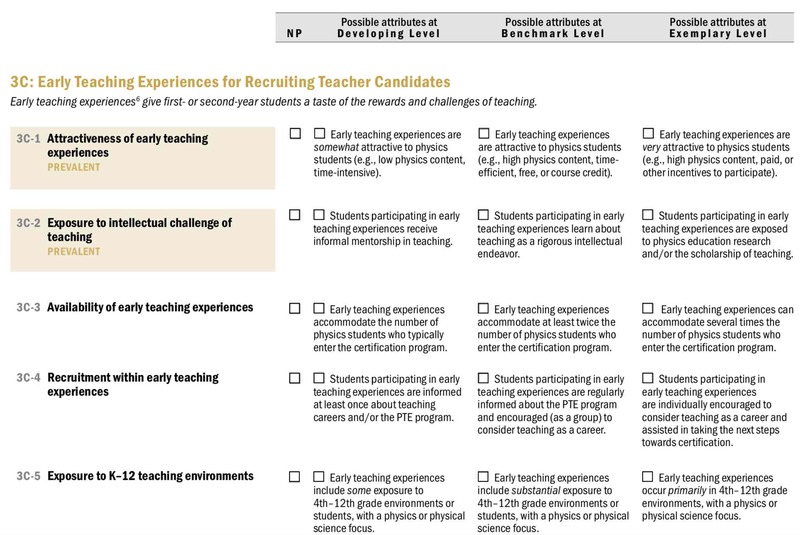 Example of PTEPA Rubric items and levels for Component 3C: Early Teaching Experiences for Recruiting Teacher Candidates (within Standard 3: Recruitment). Example of PTEPA Rubric items and levels for Component 4B: Pedagogy Courses and Curriculum (within Standard 4: Knowledge and Skills for Teaching Physics). Everything you need to know about implementing the PTEPA Rubric in your class. 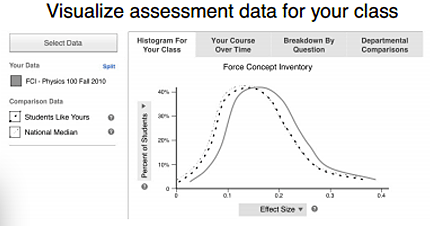 The developers website contains much more information about the Thriving Programs Study and the Physics Teacher Education Program Analysis Rubric: https://www.phystec.org/thriving/. Through extensive engagement with theory, analysis of existing instruments, review of relevant studies, and direct observations of thriving programs, independent researchers and PhysTEC staff collaborated on the development of the PTEPA Rubric. The researchers conducted in-depth visits to eight thriving physics teacher education programs. Program visits were conducted either in-person or virtually, and each visit involved interviews with a wide variety of stakeholders, including program leaders, administrators, teachers, staff, and students. Analysis of the data from thriving programs contributed strongly to the development of the rubric, provided initial validation, and supported research findings. Review by nationally recognized experts in physics teacher education as well as extensive alignment with literature and accreditation processes established substantive validity, content validity, and face validity. During the development and validation process, the PTEPA Rubric was iteratively improved through over 20 versions to better reflect the practices and structures of diverse thriving physics teacher education programs. There are no typical scores on the PTEPA, as it is meant to be used for self-study to show you the strengths and weaknesses of your program. To see typical results for high-producing physics teacher education programs, see the full report, A Study of Thriving Physics Teacher Education Programs. The most recent version of the PTEPA Rubric, released in 2018, is version 2.0.